I did have a plan to do a few easy winter routes before trying a couple of harder new lines I have an eye on, but curiosity for the hard routes rapidly got the better of that. I just had three tries on a fantastic new line with a 6 metre horizontal roof. The first attempt was a bit of a poor show to be totally honest. Climbing with tools is definitely feeling a bit alien still, so I did a lot of craning my neck looking up at it and making various excuses. There’s nothing wrong with doing a bit of training on the job though, so I went back up with Kev and fully attacked the roof. The rock is so smooth cut and featureless that it seems to be better to cut onto one tool on quite a few of the moves rather than even bother trying to get crampons to stick to overhead and distant smears. I pretty much gave up though as I just couldn’t find a way to do the move around the lip. The gap between the hooks seemed just massive and I couldn’t find anything to get my feet on at all. It’s hard to give up so easy though. That night I dreamed up a method involving throwing a foot overhead into a potential heel-toe and climbing feet first around the lip. When I went back up with Michael, it didn’t work. Not even close. Michael had a shot too and reckoned it’s harder climbing than the Birnam tooling routes - maybe M11+ climbing. Next time up I found a way to stein-pull my axe in a thin hook and do a massive and dynamic move to the first little nick around the lip. However, I didn’t have the strength to complete the route yesterday. I think a couple of weeks of circuits with tools while the mild weather is in could be just what the doctor ordered. Next time it will be really interesting to see if I can get past the lip and into the overhanging groove above. Hopefully I’ll have learnt a bit more about how to use my tools well again and be fully ready for an anaerobic battle! My house was still standing after Hurricane Bawbag and all is well as we settle into a long awaited full week at home and not on the road. Despite a million flattened trees in the glen around our house, everything except our TV signal (dodgy aerial down at the loch shore) survived. Our internet connection survived and that has been keeping us busy with Christmas orders from the webshop (thanks for those!!). We are dispatching every day as always by first class post. While the gales and sleet rage outside, I have been getting seriously into training. My finger joints are complaining about this mildly, but good sleep and food are keeping them keen for leaping between crimps on the board. Tonight I even managed a tweaked version of my model of Seven of Nine, a good notch harder than the original, which I completed once shortly before I did the real thing back in April. From my bouldering apprenticeship in Dumbarton I’ve been left with reasonably good openhanded strength on small positive edges and I’m good at getting weight on my feet when the climbing surface is fairly undulating and angled. My ever growing weakness was flat panel 45 degree angles and big pinches. I’ve kind of neglected the pinch strength aspect since few of my rock projects rely on this, something I’ve now come to regret. However, It’s never too late to get strong and I’m attacking it now with some fine pinch problems. I reckon I’m still at least 2 full grades weaker on pinches than edges as recent indoor sessions around Scotland have reminded me. Let’s see what we can do about that. The training part is easy though - It’s like eating pudding, I could just keep going and going. The hard bit is maintaining the discipline to rest properly and do all the supportive stuff to keep the body going (rehab exercises, basic strength work, flexibility and eating well). With Freida crawling about the house now tracking down anything dangerous she can get her little teeth into, it gets too tempting sometimes to take the opportunity to do some work while she sleeps. Resist! Rest up and train another day. How do I winter climb again? 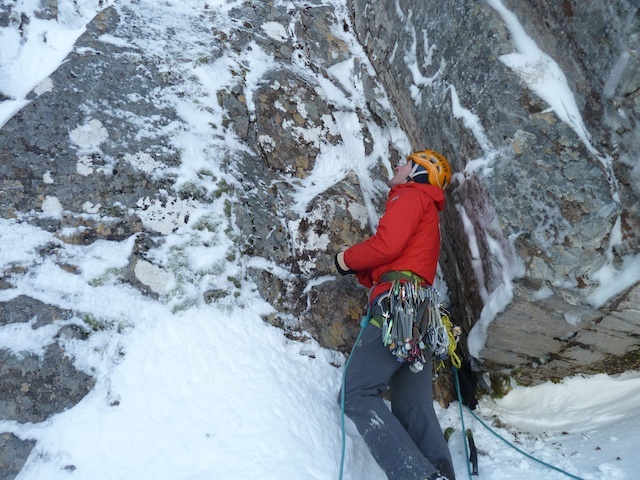 After doing Anubis a couple of years ago I took a bit of a break from winter climbing. That route was a really nice piece of climbing and was very satisfying to climb. It was hard to find something good enough to follow it. I was also really missing bouldering and felt I hard to get some strength base together for climbing the Longhope. 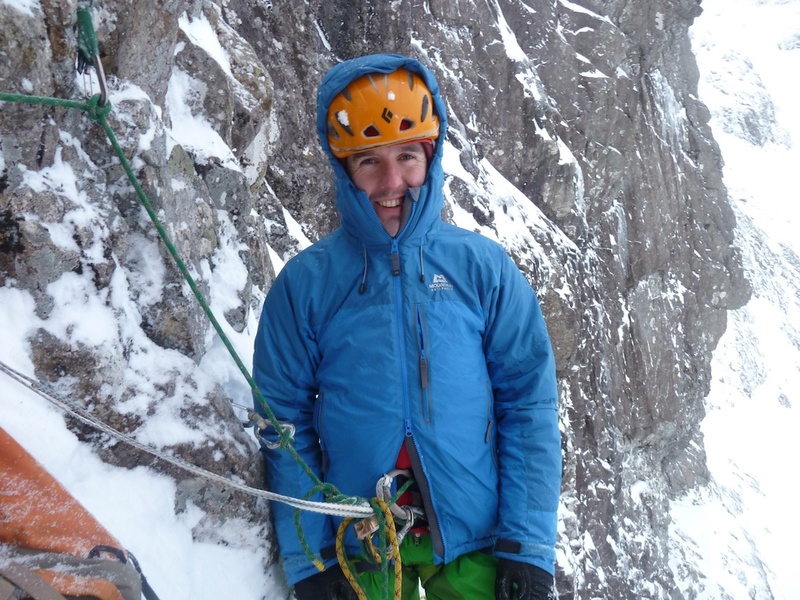 Last season I tried a couple of new routes that were maybe too hard, and then winter was over for me with imminent arrival of my daughter Freida. It’ll be interesting to see if I can find some good routes this season. 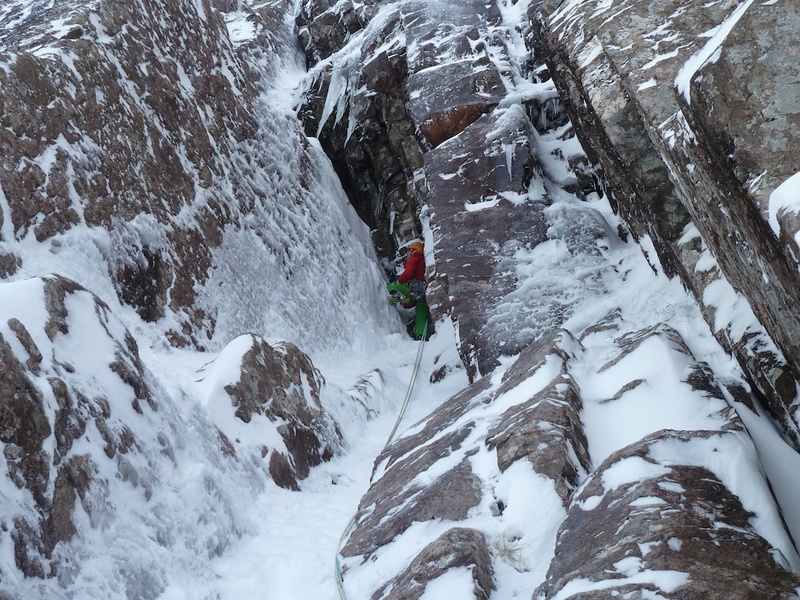 I was worried that I would feel very out of touch with winter climbing. So I thought I better start with some basics at VI or VII. It certainly felt strange to be holding tools again and a circuit around my board tonight on them felt desperate. It’s always difficult finding the real stand out new routes in any discipline, but never more so than in winter climbing. I’m really into finding steeper lines but it’s a frustrating business when every climb on the mountain is in condition except yours sometimes. But I do know about two or three lines that might have the makings of great winter routes that I’d like to go at if they come into condition this year. I think a Birnam cave session or two could be in order first though! Blink and you’ll miss it. 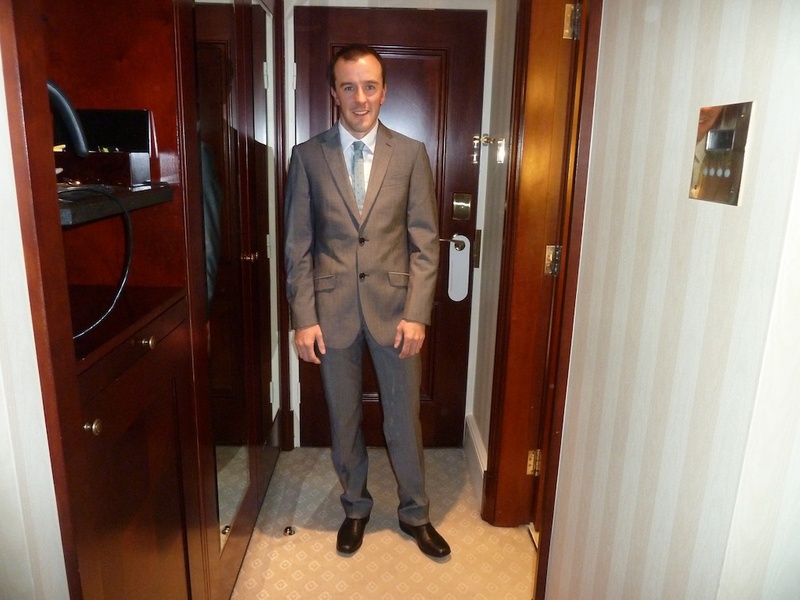 MacLeod in a suit for the first time, for one night only. It must have been some occasion, you must be thinking, to see me in a suit of an evening. Indeed! I was asked to go to London to meet the Queen, along with many other adventurers from up and down the land and beyond. We gathered at Buckingham Palace, for a glass of champagne and a royal hand shake to mark the centenary of the Scott expedition. I met many accomplished climbers I knew, some I didn’t know and spotted various royals and folks I’d seen a lot on the telly. Messner gave me some good beta about future projects too. It was a nice evening, and the trip was a nice way to spend a couple of rest days after a monster session at the TCA in Glasgow. Speaking of the TCA, it was my first visit and I was headless chickening as most folk apparently do on their first visit. It’s the best climbing wall I’ve ever been to, worldwide. I’m really chuffed to see climbing walls go to another level. I walked around all after noon repeating inwardly “I wish this was here when I started climbing”. I’m super looking forward to Christmas hols in Glasgow to get a proper feel for the place. It’s just too big to scratch the surface on your first visit. If you haven’t been yet, sort it out! As I write I have the satisfied feeling of every upper body muscle aching from a good solid session on my board - hard problems, mileage, circuits and tooling circuits and then my rehabs. With work trips finally over for the year it’s so nice just to get down to the business of uninterrupted training. We now have our stock of the Long Hope DVD and many of our pre-orders will have them by now. They are in the shop here and as usual we are dispatching every day in the run up to Christmas. I’ve just been signing a large pile of them for folk and if you’d like a copy signed, just ask on the checkout page. Signed copies are only available from my shop. Thanks for all the messages from those of you who have seen it. It seems it’s become your favourite climbing film very quickly which is good to know that what was appealing to me as a climb and an adventure is also to lots of other folks.